Maybe you have heard of them, maybe you have yet to experience them, the really cool visual and tactile learning tool – The SENSORY BIN! What is a sensory bin? It is a hands-on activity placed in a box, bucket, or even a plastic swimming pool for a child to experience hands-on lesson or theme being studied. They have a fillers, like beans, rice, and then add items that the child can play with. Some sensory bins also include smells from essential oils, scented sprays, cinnamon, etc. Sensory bin activities can be found all over the internet for toddlers, preschoolers, and even older children. How could you use a sensory bin for Sunday School? 1. For a visual as you teach your Sunday School class. Simply have your activity box with filler, it’s best to have something with a lid to transport easily. Then as you tell your story add the story items into your sensory bin, setting up the scene of the story. As you go through a series of lessons then make it a little more interesting, do not put all of your story items into your sensory bin or change some of the items in your bin. Example, if you teach about Daniel, the first week you may teach about Daniel and his friends not eating the king’s meat. You might have a king, 3 friends, and little fruit objects in your bin. In the second week you may remove the king and food and teach about Daniel in the lion’s den adding lions and maybe even some bad guys transforming it into the new story. This will renew the children’s interest in the sensory bin. 2. To reinforce elements of your Sunday School lesson in a day or over a few weeks. The child gets to play with items associated with the lesson and learn with their hands, eyes, and other senses have your sensory bin(s) before your Sunday School class or following your Sunday School lesson. If you use this as an activity instead of a visual you might make this a station where children rotate to play with it or make multiple bins of different types of Bible stories to rotate. I have made these sensory bins for the 2’s and 3’s Sunday School class that I worked in, but my children 3-8 all love playing with them. They act out the Bible stories and ask me questions about why each item is inside the box. It’s a great tool for little growing minds. 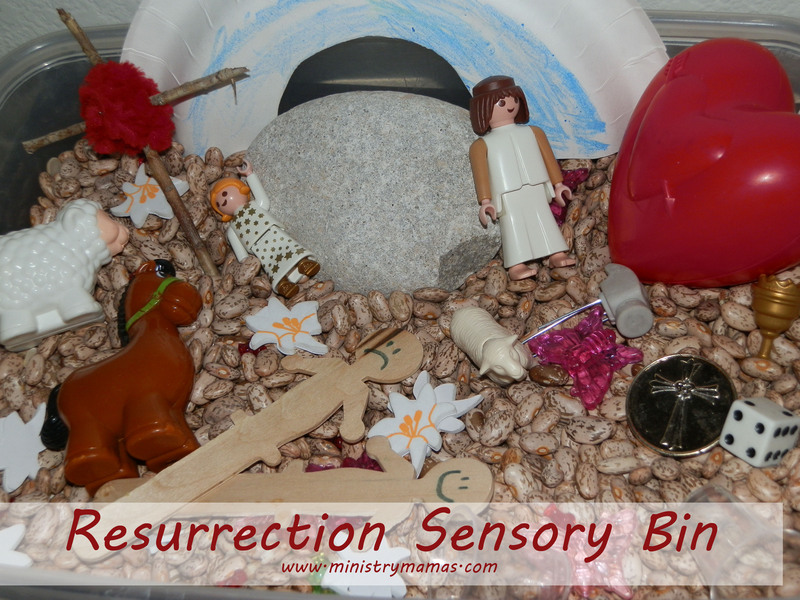 More information on the Resurrection Sensory Bin and the Creation Sensory Bin can be found at my sister site, www.ministrymamas.com. These are very popular and I figured, why not make some Bible-based bins for Sunday School!? I would love to challenge you to make one of your own for a Bible or church related activity and send me some of your photos! If I get enough photos then I will make a special sensory bin blog post.